Ezekiel bread | Fork off, heart disease! For those Europeans who have likely never heard of it, Ezekiel 4:9 bread was the absolute bomb when I was living in my home country of Canada. Made by a US-based company and based on a bible recipe (from, you guessed it, a passage from Ezekiel 4:9! 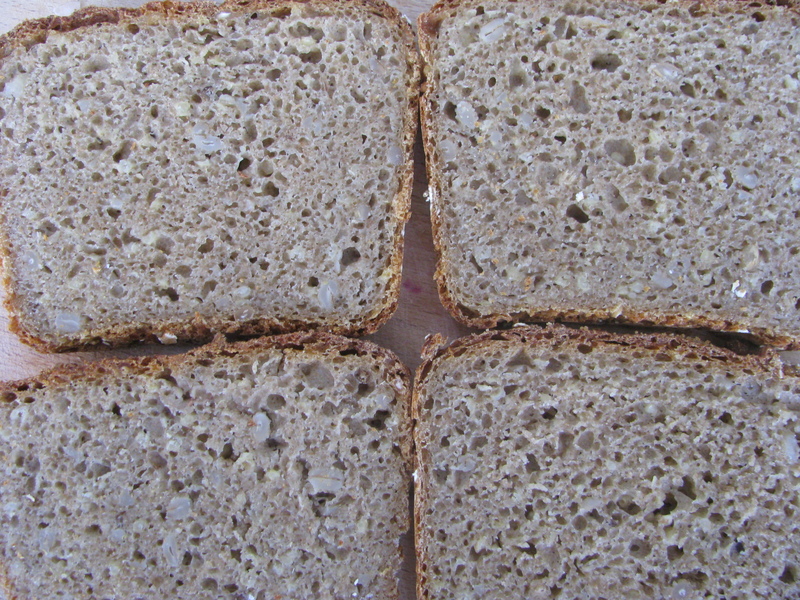 ), they make the most awesome sprouted grain breads and tortillas. You can actually get Ezekiel tortillas in Amsterdam from a heath food store that imports it, but a pack of 6 tortillas will set you back 8 freaking euros (that is 1.33 euros per tortilla – a pretty expensive sandwich I would say). 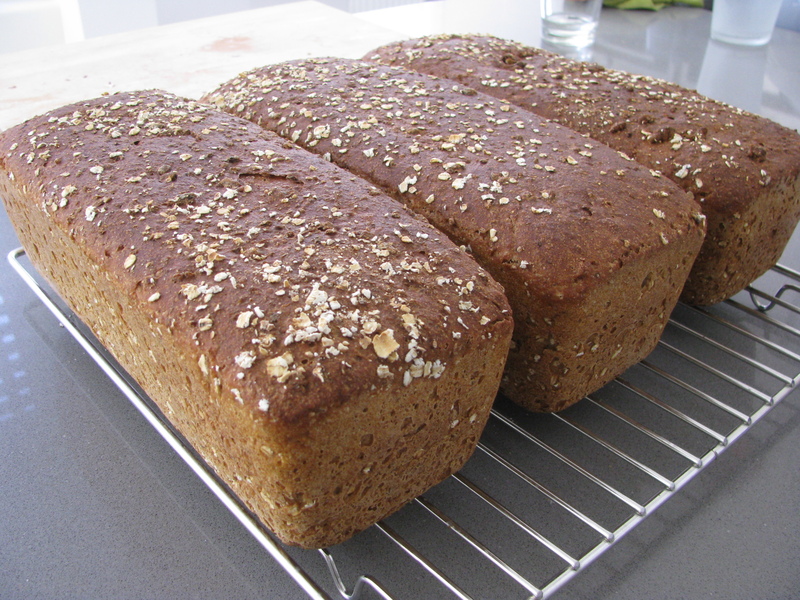 So I set about experimenting a little – how could I make my own Ezekiel bread? 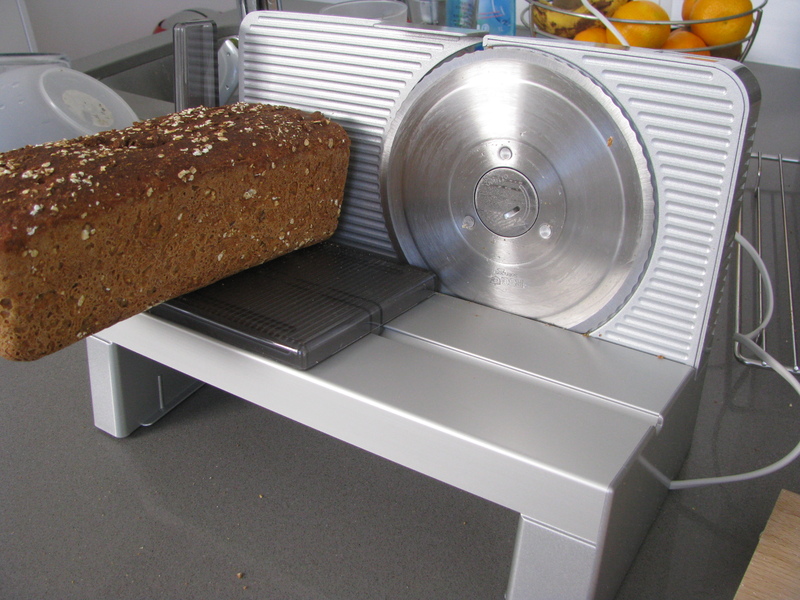 I fished around the internet and found this recipe suitable for a breadmaker. I thought that with a little tweak here and there, I could make it by hand. Disclaimer: real Ezekiel bread is made with sprouted grains but mine is a cheater Ezekiel, with the cooked versions of the grains. 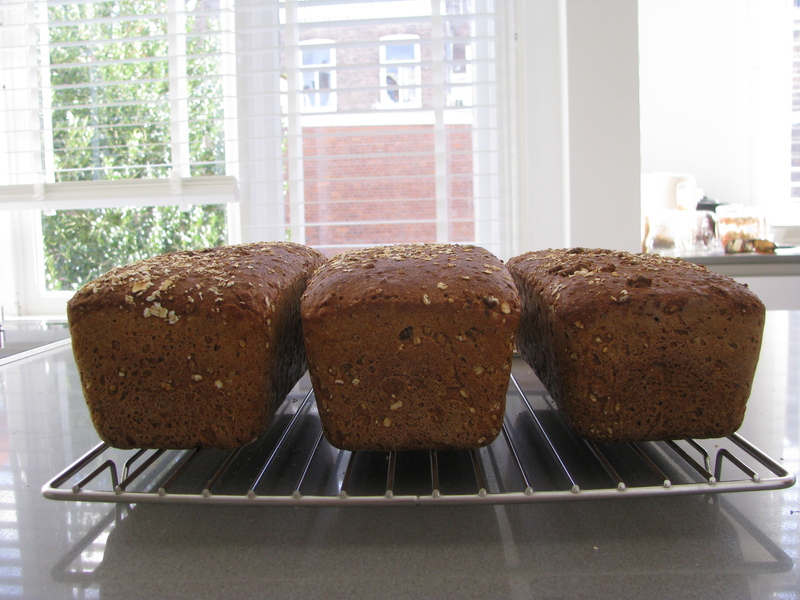 However, I will experiment with sprouted grains in the future. My first try was pretty good but the volume was not sufficient to make good sandwiches. My tins are quite long so the extra volume was needed to fill them. So I increased the recipe by a third. I ended up with about roughly 3900 grams of dough which I divided up in my three tins (a good rule of thumb: fill the tins about half way, tucking in the dough into a nice sausage shape). It was a nail biter, to be sure. I wanted to be certain that I did not put too much dough in the tins to get an unleavened brick but too little would end up with more mini-loaves. So how did this story end? Do I look good in this angle? Oh yes you do, my pretties! The best part of this bread? It is very moist with no oil and very little salt (only from the tin beans) and it still tastes great! (as opposed to making regular bread without salt, which will likely taste of cardboard). First, mix your flours and water until it forms a dough. Leave in a covered bowl at room temperature overnight. Add your barley and millet to a saucepan and add enough water to generously cover the grains (usually a 2:1 water:grain ratio). Cook the grains at low heat (covered) for about 15 minutes. Drain if necessary and let cool (I let the grains cool overnight on the stove top). The next day, use a food processor and pulse your cooled grains, beans and lentils a few times. The mix should not be too mushy. Dissolve your yeast in warm water and add to the grain mixture, along with the liquid sugar (I used brown rice syrup). Add your grain mixture to your dough and incorporate by kneading. Your going to have to really work the mix in there. For my batch, this took about a good 10 minutes of kneading and squishing the dough and grains together. Eventually you are going to have a nice, somewhat sticky dough. If it is too sticky, add a bit of flour (but not too much). Let the dough rise for about 2h (approximately) at room temperature with the bowl covered by a plastic bag (this rising time might be shorter or longer, depending how warm or cold your house is). Afterwards, separate the dough into three sections, which will be approximately 1350 grams each (give or take, precision is not necessary). You may need a bit of flour here as well if the dough is too sticky to handle. Roll the pieces of dough in oat flakes, seeds or whatever you fancy. Place the dough in the bread tins (I have ceramic-coated ones that do not need to be oiled) and shape into a loaf. Place the tins in a plastic bag to trap the heat and moisture. The dough should fill approximately half the height of the tin. Let the loaves rise until they crest the tin (mine took about 2 1/4 hours). Set the oven temperature to 230°C. Gingerly place the loaves in the hot oven and bake for 12 minutes. After that, lower the oven temperature to 200°C and bake for 30 minutes. At this point, my loaves are usually lighter in the bottom than the top so I remove them from the tin, flip them upside down, and bake them for an additional 10-15 minutes. ← Road trip to Amsterdam to see Terry Hope Romero!